Malbec, the signature red wine of Argentina, is well-suited for winter drinking, full of dark fruit and chocolate flavors that go well with meats, rich soups and stews. It’s the wine that I drink while sitting around the wood stove on a frigid night, and Don Miguel Gascon makes one of the best, affordable, widely available Malbecs on the market. It has become a house favorite, particularly when I find it on sale near the $10 range, sometimes as low as $9.99. Malbec wines are fine for sipping, but I much prefer them with food. Malbec is said to have originated in the southwest France wine region of Cahors, where the grape is known as Cot. At the request of the country’s president, cuttings of vines arrived in Argentina in 1853, on April 17, which is celebrated as World Malbec Day. The grape thrived in the arid, high-altitude vineyards, and the dry red wine soon put Argentina on the world wine map, according to the book Red Wine: The Comprehensive Guide to 50 Essential Varieties and Styles by Kevin Zraly, Mike DeSimone and Jeff Jenssen. Gascon has been along for Argentina’s Malbec ride for more than 130 years, and in the 1940s, the winery became the first in the country to make 100 percent Malbec wines, the company’s website says. In 1880, Miguel Escorihuela Gascon immigrated to Argentina from Aragon, Spain. He was 19 and found a job working in a grocery store in Buenos Aires. That was where he got his first taste of Argentine wine, which arrived at the store in 300-liter oak barrels from Mendoza, says an online history of the winery on winesofargentina.org, a website connected to the Argentine Winemakers Association. A couple of years later, Miguel Gascon moved to Mendoza, about 600 miles west of Buenos Aires. He and partners opened another grocery store, and by 1884, Miguel had made enough money to purchase about 35 acres near the mountains. He planted grapes in the highland vineyard and built his winery. Gascon was one of the richest men in Mendoza by 1910, and he was bestowed the honorary title of Don. He built schools, roads and a hospital in Mendoza and in his hometown in Spain, where he was considered a hero for giving everyone a job who needed one. Don Miguel died in 1933, and his family has continued his legacy by making fine wines, some of which became President Juan Peron’s favorites. The winery was a little down at heel when, in 1993, pioneering winegrower Nicolas Catena bought it and put in modern equipment and techniques that have made Gascon one of the leading wineries in the country. Today, Gascon produces more than 3 million bottles of wine annually from 383 acres of vineyard that have an average altitude of 3,600 feet. Organic farming and production practices are being put in place now, and the company is seeking total certification. The wine is sold around the world. Gascon also has one of Argentina’s top winemakers overseeing production. Matias Ciciani, who grew up just down the road from the winery, was encouraged by his father and grandfather, both viticulturists, to enter the winemaking profession. Ciciani attended top winemaking schools and worked in wineries and vineyards in Spain and Argentina before returning home to work for Gascon, where he built his reputation by producing award-winning wines. 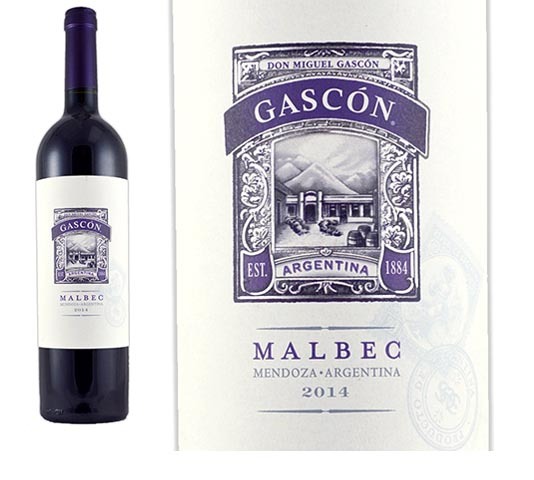 For Gascon Malbec, the grapes are hand-harvested and cold soaked for four days before fermentation, to preserve the deep violet color of the fruit. During fermentation in stainless steel tanks, the juice is left in contact with the skins up to four weeks to foster flavor development. In the secondary fermentation, the wine spends seven months aging in oak barrels before being bottled. The result, Ciciani says in the tasting notes, features aromas of blackberry and plum with a hint of mocha and dark fruit flavors intertwined with spice, licorice and chocolate that create a full-flavored Malbec with a long, velvety finish. “In many ways, Malbec is a bit of Argentina in a glass. Its flavors are full and rich, and underneath there are layers and depth. Argentina’s vibrant culture has those same layers, from bold to sophisticated,” Ciciani is quoted as saying in Red Wine. In addition to Gascon Malbec, Ciciani also makes a number of higher-end red wines, including the Reserva Malbec, which often goes on sale in the $18 range. It’s widely available and worth checking out for a special occasion. In the meantime, try the Malbec. It’s a lovely wine and a terrific bargain even at its full price.